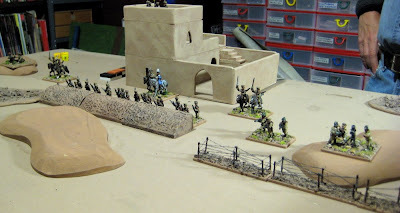 Now to finish off that first Roman army, then forge ahead with some Anglo-Danes…! I had a little accident last night while cutting some MDF for some 3-D dungeon terrain tiles I was building with Jackson. 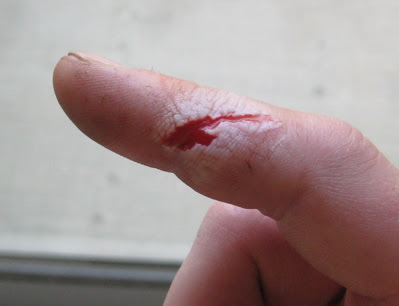 I was cutting some on the table saw when it kicked back at me and tore a chunk of flesh off my right index finger. Oh nothing that would require surgery to re-attach or anything... But being right handed this has made doing anything requiring fine motor skill somewhat challenging and/or painful.... So I'm probably not going to get much painting done over the next week or so. On the plus side I might get some reading done... or not... I didi just pick up the next three discs of the HBO Rome series from the local library.... After watching that I'm not sure what will be more "painful" - painting more Romans or NOT painting more Romans! A week or so ago I took out the first couple of the HBO Rome Miniseries from the local library. Amanda and I have been quite enjoying it, though we now have to wait a bit until we can get the next disc(s) – as they are quite popular! 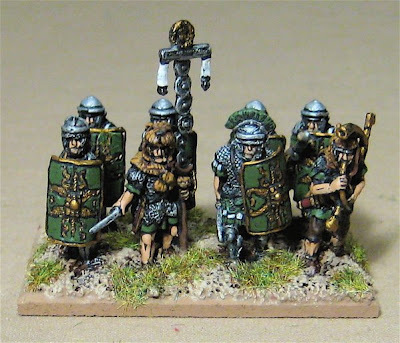 While watching that I painted up a few more stands of Romans for my Early Imperial Roman DBA Army. I just have three more stands of Blades and a stand of Artillery to finish up. This will be my Blade General Stand (I also have the option of fielding a Cavalry General). As with the others, these are old 80’s Citadel miniatures that were produced by Ral Partha in North America. 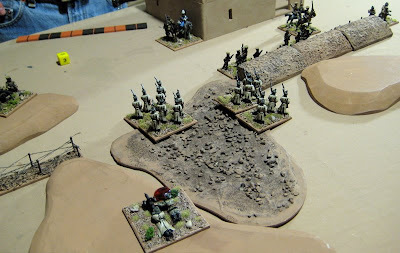 …and a stand of Cavalry. 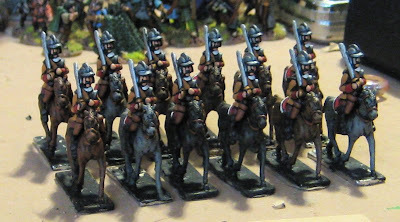 I think I could also add another stand of Cavalry or Light Horse – as alternates to the Psiloi/Bow. WE shall see. This is just an old figure that I stripped a while back and started repainting… and just finished up to get him off the workbench. I have no idea who the manufacturer is. I think I bought it around 1984-5? I used him for years as a D&D character figure. 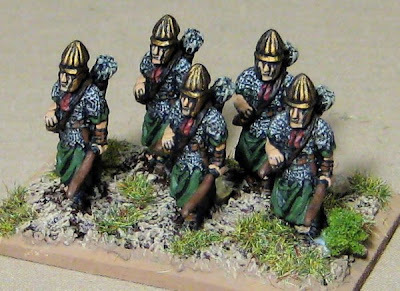 August – Anglo-Danish – this is an army for CVT I already have some Anglo-Danes, though there is a few extra stand I need to finish up for myself. 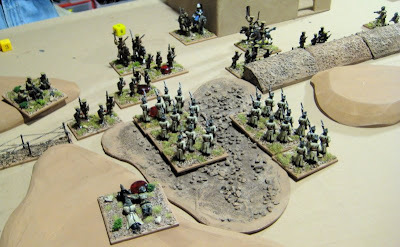 Also, a second unit of Cavalry for John. 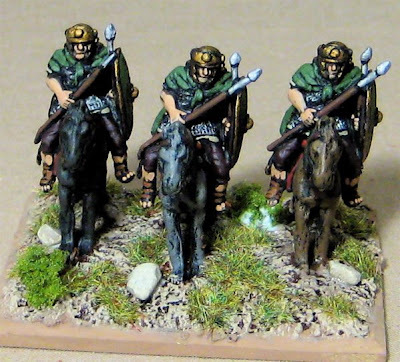 September – Normans and Picts – Both are partly complete so I figure I can finish both off this month… A third unit of Cavalry for John. Yeah… so I kind of went overboard with the RAFM ancients sale on this month and picked up enough stuff to finish off FIVE successor armies (at $4.50CAD for 6 infantry or 3 mounted how can you go wrong!? 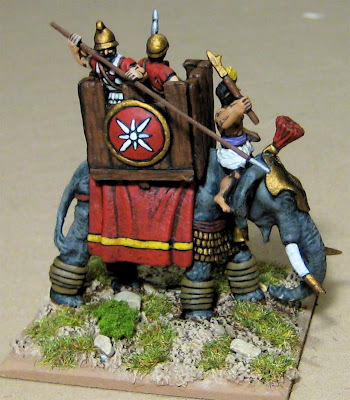 )… and while I was at it I picked up enough for a Skythian army… and a Thracian army… and a Classic Indian army…. 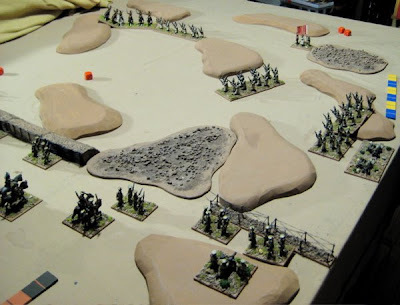 Oh, and a German Army…. Umm… and I picked up a few other things for Amanda’s HOTT army… and some stuff for some other HOTT armies… and some Irish and Elephants from the Sentry Box…. And a couple Ospreys from Amazon… Which blew my toy budget for the next YEAR! So I’m putting a moratorium on further figure purchases for one year. The Campaign for this October will be the “Back of Beyond” Campaign mentioned in the previous post. This is mostly because I pretty much HAVE everything I need to run it. I could run it tomorrow if I had to. I’m not going to. I’m going to run it in October. That will give me some time to add a few new elements to a few of the armies and work on the rules a bit more. I should have enough forces for up to SEVEN players!? Now I just have to figure out a date and start recruiting! In February – probably around the end of the month so we can make it another Wargaming Birthday Bash Weekend – I’m going to run a 1066 Campaign. Again this is mostly due to the fact that I have a few of the armies already done and the rest are underway. I could easily have seven players again for this one (Vikings, Normans, Anglo-Danish, Scotts, Welsh, West Franks, Irish…), and could potentially add a couple others (additional Vikings and Anglo-Saxons…?). The other campaigns… well… we’ll get to them eventually. In addition to the weekend campaigns I’m still planning on running a HOTT email campaign in the fall. I might run others as email campaigns or weekly turn, extended campaigns for the local lads… we shall see. 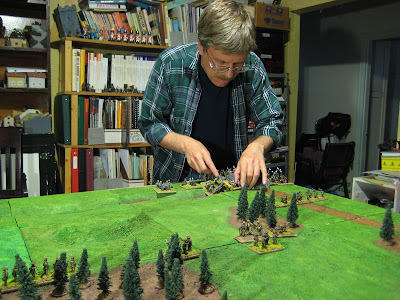 Last week John and Rick and I got together to play some more Great War DBA. WE tried out some further tweaks to the the DBA1500-1900 Extension (by Tony Barr) that we have recently been adapting to the era. Bolsheviks invade Sinkiang province in North East China! The Bolshevik force is attacking a city in Sinkiang province. The local Chinese forces have had some time to prepare wire, etc. I don’t’ remember much, but here’s a few pics…. The Chinese defences before the city. The Bolsheviks storm across the broken ground between the trenches and the wire in battalion assault columns! The Bolsheviks cleared away the Chinese before them, but at a terrible cost! This week’s looking pretty busy, I doubt I’ll get a game in. I got to thinking, however, that I’d really like to run more one-day “in-person” campaigns, perhaps as many as two or three each year. I could possibly run one as early as this fall. If I ran three a year, distributing them evenly throughout the year, and used this past Campaign as the starting point that would put one in October and the next one in February. Both seem like they might be decent times. 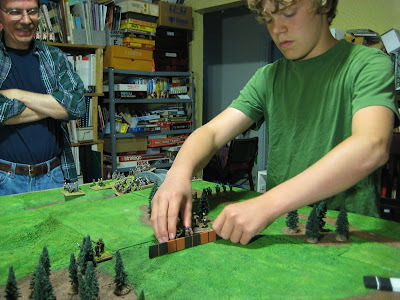 February is perfect for having a Wargaming Birthday Bash Campaign day! I’m not expecting that all the folks that came to the last one would be able to make it out to ALL of them, rather I’m hoping more regular campaigns might give some of the other folks who missed the last one an opportunity to get in on the action. Obviously I could easily throw together a HOTT Fantasy campaign any old time now that I have the armies I prepared for this first campaign. 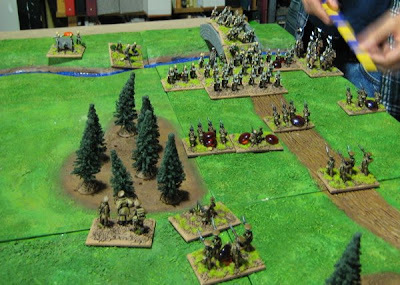 As I continue to add to these armies there will be more options for players and/or larger armies and the potential for more participants. This has sort of been a dream for a while, but I now have, in addition to more or less complete Anglo-Danish and Viking armies, enough figures to do Norman, Welsh, Irish, and Scotts armies! This is closer to happening than the Campaign for Middle Earth! Okay I don’t actually know much about the history of Rome (which is sad, considering I did take a Roman Classics class at one point…), But it seems to me they did have some civil wars, and I do happen to have almost enough for three or four DBA Early Imperial Roman armies… Of course I could just run an campaign centered on Rome where there happens to be three or four Roman players and they can work together to crush the other players and expand their empires… or have a civil war to see who is Master of all Rome – while the others pick away at their empire… Could be fun! I guess I’d have to get some additional armies for this one. I thought it might be fun to put together forces for a half dozen or so “Imagi-Nations” for a campaign nominally set somewhere between the War of the Spanish Succession and the Seven Years war. 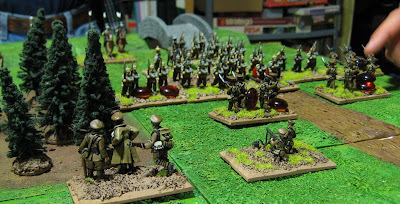 I’d use the DBA 1500-1900 extension and twelve stand armies of very generic home-cast tricorne figures. 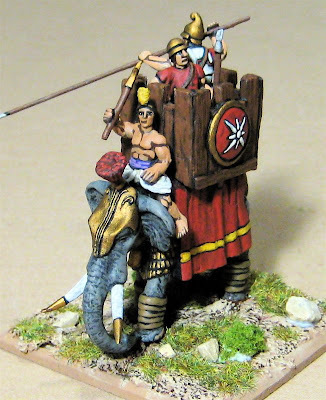 This might be fun to get others in on the painting and designing of the armies of their various duchies, nations, etc.– if I could get them to agree to a common system of basing!? The Far East during the Russian Civil War seems a suitably chaotic setting for a DBA-ish campaign. I could offer a number of different factions that could make temporary agreements and turn around and then stab each other in the back when it was beneficial to do so… If I could hammer out some rules that I like, this could very easily be done as I have Warlord Chinese, Tsarists, and Bolsheviks. If we were using armies of about 12 stands like DBA I could probably put together TWO of EACH right now! To this I could add some “Canadian Interventionists” using the Great War Canadians I also already have… It might be fun to make a few more armies – the Army of British India, “Basmachi” Rebels, etc. Similar to the Horse and Musket “Imagi-Nation” idea above I thought it might be fun to come up with some fictional Balkan countries (Bertzegovnia, Zergia, Syldavia, Borduria, etc) and make up a number of small forces for each and have a little Balkan war nominally set in the early years of the 20th Century. So, who’d be up for a campaign in October!? Or February…? It looks like the “Back of Beyond” or another “Generic” Fantasy campaign would be the most realistic possibilities for October. Which of the others would you be interested in? 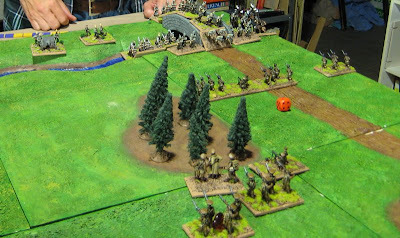 The main differences between this and the Last Game was, beyond using DBA instead of HOTT, was that Rifles could move 300 paces/turn, were +4vs foot/+5 vs Mounted and NOT quick-killed by all mounted! 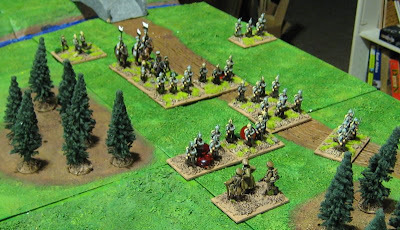 The cavalry we were using this week were Uhlans – which I classed as Light Horse and were only +2 vs everything and WERE quick-killed by rifles they’d just moved into contact with! 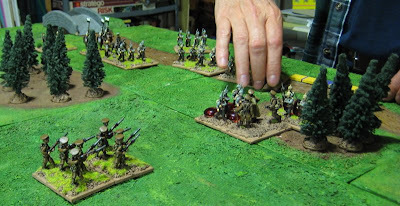 Quick –firing Artillery we extended the range to 1800 paces, MGs we had at 500 and the same factors as rifles, and we allowed them to move through bad going, but would require an extra PIP to do so! The French to the British right have crumbled and the British Corps, in danger of being flanked and enveloped, is falling back to establish a new line. A holding force has been left behind to cover the Corps retreat and stall the German advance long enough for the British forces to establish their new line of defence. I figured this was going to be a tough one for both players. The British had a large front to defend with a small force which they would likely have to disperse across the entire front otherwise the Germans would simply march through whatever gap they left open. 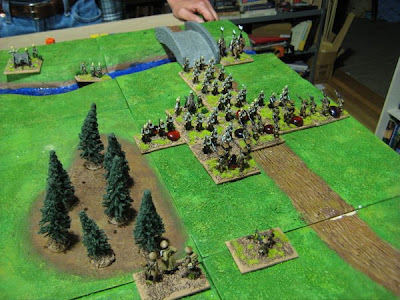 The Germans had a pretty tight timeline to get half their force across the table – in good going it would have taken 10-12 turns to get across – depending on whether they took the bridge or tried to cross the river. Oberst Lowell setting up the Gemran forces. The Germans were not so blessed and took some time getting across the river. 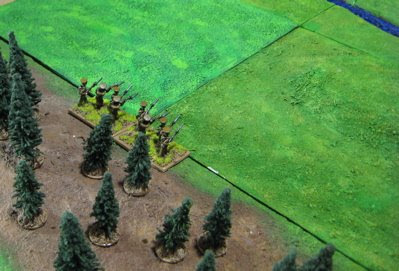 The Germans slowly making their way across the river and trying to deploy into something like a line. Shots are finally exchanged and the British (and Scottish!) seem to be taking the worst of it! 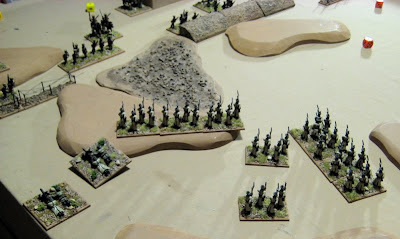 The gemrans surge forward and the British line is broken up in a mad battle! The British attempt to reform their line and stem the tide of Huns sweeping down on them! The steady British hold but are slowly pushed back by the sheer weight of the force opposing them. With the resistance all but wiped out the Germans surge forward again! 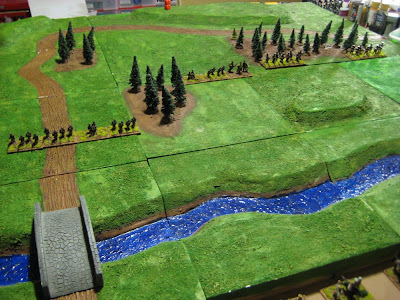 With nothing in their way but the British headquarters, Oberst Lowell desperately tries to get his troops formed up into a column to march down the road and make their way to the British second line before it can be established! 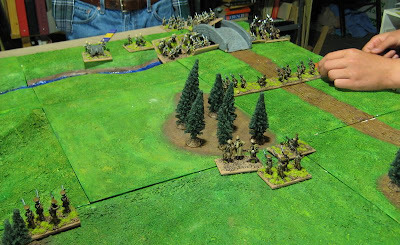 Though the small group of reinforcements was on the way the British headquarters is overrun. We liked this a lot better than the HOTT variant we were using previously. We need to make a few further tweak. I think the MGs range will be increased to at least 600paces… maybe more. I need to finish up some more British! 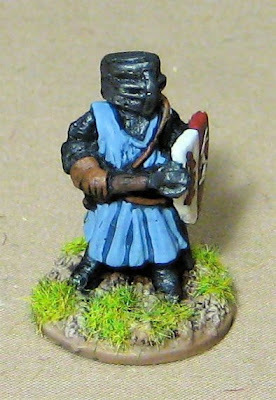 Again, these are old 80’s Citadel miniatures that were produced by Ral Partha in North America.